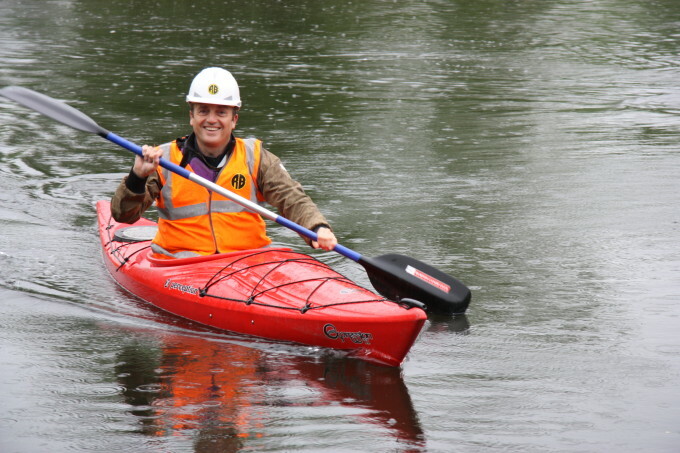 Improved access for all is now the order of the day for keen canoeists in Burton-on-Trent. A new lift has been installed at Burton Canoe Club which will enable everyone to access the upper floors at the club where the club room, indoor gym and changing rooms are located. The cost of the new lift was met thanks to a grant from the VINCI UK Foundation which was proposed by Derbyshire-based foundation engineering company Roger Bullivant Limited, which is part of the VINCI Group. Bachy MD and VINCI Foundation representative Phil Hines (pictured), visited Burton to meet club representatives at their Newton Road clubhouse to check out the new improved facilities and to have a paddle up the Trent. The canoe club, started in 1978, offers a range of canoeing and kayaking activities, not just to members, but to local community groups, scouts & guides, schools and disability groups on a non-profit basis. It is entirely run by volunteers and as well as outdoor activities they run a variety of workshops in the meeting room such as first aid, environmental, group awareness and safety training.